Jake Ball might have played cricket for Australia had he not loathed fielding so much. But Australian cricket's loss is Welsh rugby's gain, and the second-row will run out against the Wallabies at Millennium Stadium in Cardiff on Saturday. Ball, a teenage cricketing peer of Australia Test duo Shaun and Mitchell Marsh tutored by their father, former Australia opening batsman Geoff Marsh, struck fear into opposition batsmen on pitches in Western Australia renowned for their pace and bounce. He describes his slinging action as similar to that of Australia spearhead Mitchell Johnson, but "probably more Jeff Thomson". England-born Ball migrated to Australia with his family at the age of 16, with cricket his sporting plan. "I went out there to play cricket, and I did it for two years," said Ball, who qualifies for Wales due to his Welsh father. "I was a fast bowler and I played alongside the Marsh boys. I miss the competitive edge of the bowling, but I hated standing in the field and I was a tail-end batsman as well, so I ended up spending a lot of time sitting around." Ball also doubts he had the temperament necessary for cricket, saying he "was probably a bit over the top". "If I got nicked through slips and that, it would be a case of trying to keep my cool. I wouldn't say it was sledging; I was more of a quiet angry man, I think." Ball, 23, opened the bowling for Western Australia Under-19, but he "realised that cricket wasn't the path I wanted to go down". Ball captained the Surrey Under-15 rugby team before heading to Australia, and he was training with the Western Force Super Rugby squad when the Scarlets spotted him before quickly offering him a three-year contract in 2012. He broke into the Wales squad less than two years later, making his Test debut as a replacement against Ireland during last season's Six Nations Championship before starting against France and England. He also toured South Africa with Wales in June, featuring in the agonising 31-30 defeat in Nelspruit, and he is viewed as an important part of head coach Warren Gatland's second-row armoury alongside the likes of Alun-Wyn Jones, Bradley Davies and Luke Charteris. "I am just happy to get this opportunity, to be honest," Ball said ahead of a first start against major southern hemisphere opposition. "I think it is going to be a brutal contest, and we will get stuck into it like we would any international game. "I know a couple of their players [Matt Hodgson and Ben McCalman] as well, so it means a lot to me this game. 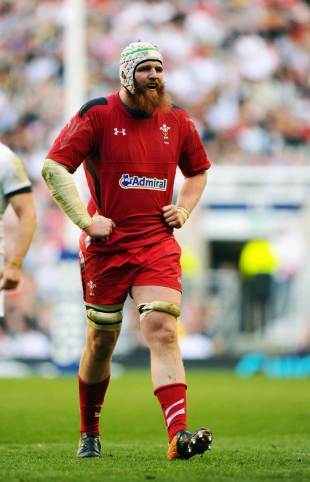 To get picked [in the Wales starting XV] was a big goal of mine."